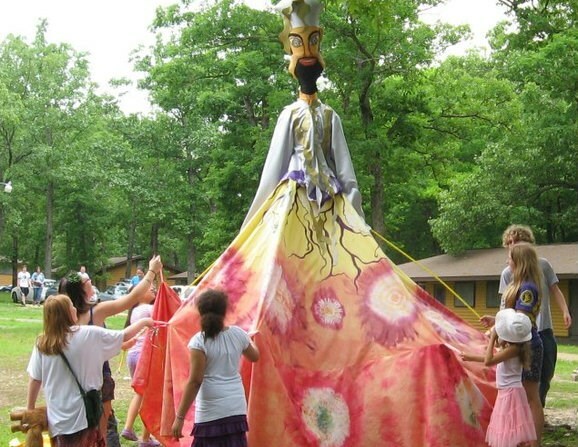 Introducing Ozark Sufi Kids Camp! The Kids Camp is full of love and light! Any child 5 and older can be dropped off at Kids Camp during designated hours to allow parents to go to classes and evening programs. Younger children are welcome to join in with a parent! Sports and Hikes and Parades! Crafts and Games! Music! Story Time! Kids Camp Half-Scholarships for Parents! Please Note: Kids Camp no longer takes the children swimming as an activity. Parents will now get to enjoy swimming with their children as a child must be with a parent to enter the water. We emphasize that Life Jackets are recommended when lake swimming, especially for non-swimmers and the younger children. Noodles are not safety flotation devices. There are no life guards. Camp is not responsible for the safety of any swimmers. No registration fees are charged for children under 5 and they are not necessarily assigned a bunk. They must be on a registration form, however. Please note that every camper aged 5 and up is required to pay a $10 Liability Insurance Surcharge. Please be aware that ticks and chiggers exist at camp, especially in dry autumn leaves. Your insect repellent should be effective on them. Natural insect repellents are encouraged. To monitor the camp’s potential weather, look up Osage Beach, MO 65065 online. Temperatures in central Missouri vary day to day and hour to hour. Think layers as you pack your clothes.